Dr. Thomas Heege, managing director of EOMAP, has more than 20 years of experience in aquatic remote sensing and technical consultancy. As a remote sensing expert with experience in projects around the globe he is familiar with implementing user’s needs into practicable solutions for offshore and water industries. 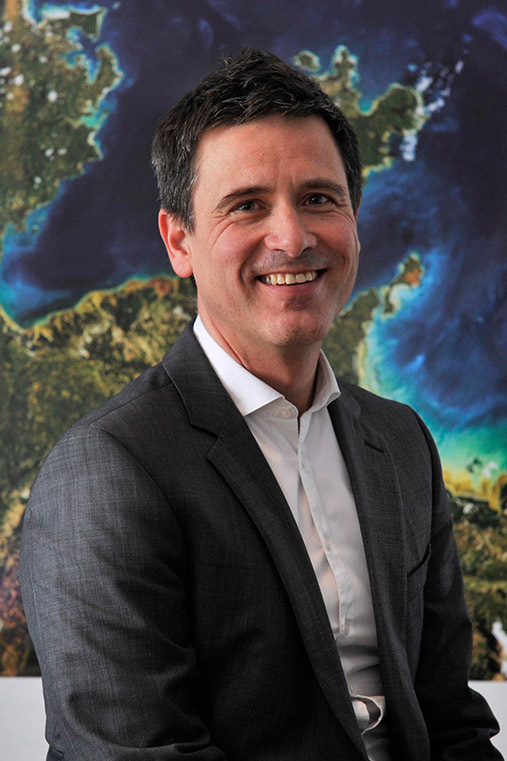 Prior to founding EOMAP in 2006, he worked as a scientist and project manager at the German Aerospace Centre DLR and water related research institutes. Thomas graduated as Physicist in 1993 at the University of Konstanz, and received a PhD in space sciences in 2000 at the Free University of Berlin. EOMAP GmbH & Co.KG, headquartered in Seefeld near Munich in Germany, is a world leading company for optical remote sensing in the aquatic sector. Specializing in marine, coastal and inland water environments with up-to-date technologies, EOMAP guarantees robust and standardized products for a broad range of spatial and temporal resolutions. Our clients – representing industry, academic and government sectors – benefit from cost and time savings, rapid data access and worldwide coverage. We maintain an active role on national and international levels, adapting operational, standardized technologies and innovation to meet the requirements of our users. EOMAP is headquartered in Castle Seefeld, just outside of Munich and EOMAP Australia is based on the Sunshine Coast, Australia. EOMAP’s processors provide daily data with global coverage for several key parameters like Turbidity, Total Suspended Matter, Chlorophyll-a or Harmful Alage Blooms and are e.g. used for establishing historical baselines, ongoing dredging plume monitoring, environmental impact assessments and environmental management applications. The IIWQ World Water Quality Portal, developed under the International Initiative on Water Quality (IIWQ) of UNESCO-IHP, is the first global water quality information and capacity building tool, using Earth Observation and satellite data. The Portal is not only an important contribution to improved global water quality information, but also promotes science-based and information decision-making on water quality, which will lead to sustainable water resources management toward the achievement of the Sustainable Development Goals (SDGs). In view of scarce water quality information at the global and national levels, the Portal will be a valuable tool to obtain water quality information, especially in remote areas and in developing country regions (such as Africa, Asia, Latin America, and SIDS) where water quality monitoring networks and laboratory capacity lack. It is also a decision-support tool and will help countries identify the most pressing water quality problems such as pollution hotpots. Hence, the Portal will support national efforts for the implementation of water quality related SDG targets as well as for monitoring progress towards their realization. Remote sensing is an efficient and cost-effective tool to assess a variety of physical and biological parameters in aquatic ecosystems over small-scaled and large areas. The IIWQ Portal can respond to the challenges that utilities and other agencies have for effectively monitoring and responding to water quality threats such as algal blooms and turbidity. It is the first portal to combine high resolution global coverage with the range of measurements needed for effective global water quality monitoring and user-friendly features. We are thrilled to be chosen by UNESCO to support such an important programme and help promote collaboration to address global water quality issues. Water security is crucial in achieving sustainable development and thriving economies. EOMAP products and expertise are well positioned to support those goals. Mit dem neuen Online-Portal stehen zum ersten Mal politischen Institutionen, Umweltbehörden, der Gewässerindustrie sowie universitären Einrichtungen weltweit flächendeckende wichtige Wasserqualitätsinformationen zur Verfügung, die als Entscheidungshilfe für das nachhaltige Wassermanagement dienen.Ein weiteres Beispiel dafür, welche Bedeutung Erdbeobachtung für das Management unserer Ressourcen hat. Dies schließt auch die Bereitstellung kommerzieller Fernerkundungsdienste auf einem international wachsenden Markt ein. Der weltweite Wasserkreislauf verändert sich deutlich in Folge des Klimawandels und menschengemachter Einflüsse. Wir sehen die Auswirkungen in Form von Naturkatastrophen, Veränderungen globaler Sedimentflüsse und einem übermäßigen Nährstoffangebot.Das IIWQ World Water Quality Online-Portal ist als Entscheidungshilfe konzipiert, um Länder und Regionen weltweit in ihrem Bestreben nach größerer wirtschaftlicher und ökologischer Nachhaltigkeit und bei der Entwicklung von innovativen Lösungen zu unterstützen.